Iconic, generational and influential the original Star Wars and particularly the very first 1977 movie have had so much said about them and so much love (and hate) aimed towards them that it is nearly impossible for the makers of this new series to match expectations. Yet the omens have been good. 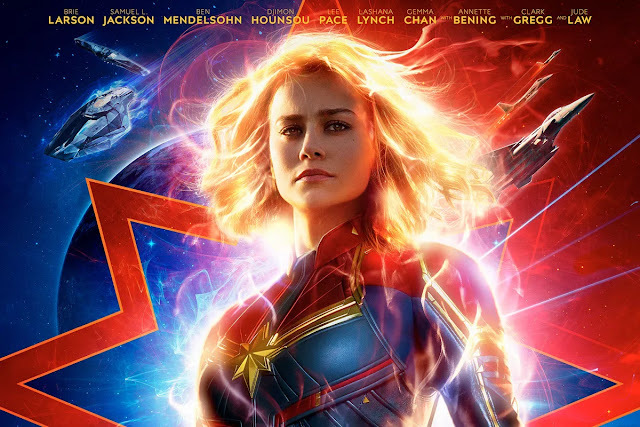 The trailers looked like Star Wars- in a manner that the prequels just did not- and the return of three key characters has generated excitement. However JJ Abrams has already rebooted the Star Trek Universe by sweeping away old time lines and inventing his own. Some people had a bad feeling about this- would he dare do the same here? The answer is No. 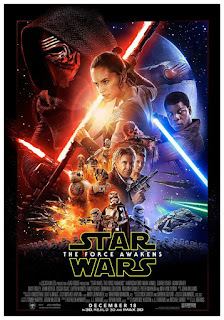 Instead he has done something much more pleasing – he has made a Star Wars film. A big, rollicking, action packed, exciting, visually arresting Star Wars film. Simon Bates: "Hello and welcome to Top of the Pops. It's gonna be a great night because we've got some great live acts for you. We've got Gary Numan, and we've got stacks more because it's the last Christmas Top of the Pops before the Christmas Top of the Pops, if you see what I mean. We'll also have the top three selling records in Britain today and to kick us off with, here's The Beat. Over there!" The Beat: Too Nice To Talk To . The top of the show preview of tonight's bands has gone. Is this a permanent change to the format or was there no time to edit one together? When Simon Bates says "over there" the camera cuts to a wide angle of the studio and the lights are faded up on The Beat, who begin to play. The crowd rushes across the studio in what looks like a dangerously uncontrolled way. Still there's no harm done, except for the sound of several balloons popping on the soundtrack. Once upon a long time ago I wanted a fort for Christmas. Not a full sized one of course, that would be a tad impractical but a model one. And I got it. It was a simple enough affair; four walls that slotted together to enclose a decent sized area in which there was a building a bit like a sheriff’s office. The fort had swing doors that could be sealed against invaders and each wall had a narrow shelf inside to be the battlements. Though clearly designed to please those who’d watched films like The Alamo on TV during school holidays ( and it was on every holiday) it actually doubled fairly well as a medieval fortress or indeed any other type of fort or castle you wanted it to be. Children’s imaginations being much broader than adults’ this fort was the setting for numerous adventures over the years. Amongst its inhabitants were Cowboys, Indians, Knights, various farmyard animals, a bison that was out of proportion to the other characters and even a giant rubber crocodile. Cars mingled with horses in various battles and however many times the fort was attacked its four walls- made of some sort of treated wood- remained as robust as the day I first got them. It was no less than the best thing I’ve ever been given in my whole life. 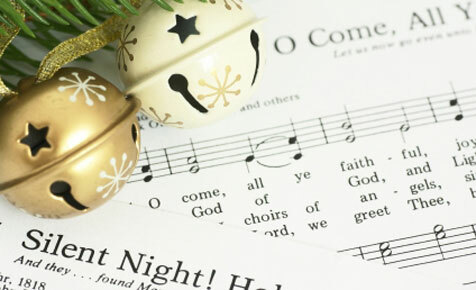 Long before Christmas pop songs (see previous Blogmas) there were Christmas carols which are altogether more serious. You can feel the weight of ages in these creaky edifices which is perhaps why their use is mostly confined to the echoey churches and cathedrals in which such hymns work. Backed by the melodramatic sounds only a church organ can pipe out, they are supposed to be a communal celebration of the season. Things is that mostly they don’t actually sound very celebratory; indeed most start up like a heavy mammal attempting to stand. Hark the Herald Angels Sing for example feels like pushing a heavy object up a hill! The merrier ones just seem to be irritating though; have you ever enjoyed working your way through Ding Ding Merrily On High? 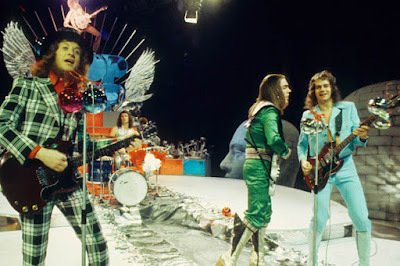 Richard Skinner: "Welcome to the Top of the Pops studio where today we are celebrating Christmas a little early. We've got a fascinating show with some good music, some great live bands as well, and if you're looking for clues as to what we've got on today's Top of the Pops... well how's about this for a start." Adam & The Ants: Antmusic . The studio looks more like a pop warehouse than normal. Wide shots reveal a dark cavernous space with a small crowd huddled in front of Adam & the Ants for mutual security. Top of the Pops must have been allocated one of the larger studios at Television Centre and gives the impression that this programme is being recorded in a black wasteland haunted by the angry ghosts of failed music acts. On the plus side the extra space allows for some lovely sweeping crane camera shots. Then, in a new development, the camera cuts to the Eidophor screen and the Antmusic lyrics can be seen. Was Top of the Pops experimenting with karaoke? Finally, as the song ends, we get a lovely wide shot of the studio, but what's that sitting on the studio floor to the right of the picture? It looks like a mop and bucket. One of the things we often forget is that most Christmas songs are recorded in the summer so it’s a miracle that any of them manage to evoke snow, tinsel or indeed figgy pudding, whatever that is. So let’s take a look at some well known festive ditties and see how they fare nowadays…. The quintessential Crimbo song started out with a different lyric before Noddy and co decided to amend the earworm of a tune to encompass the festive season. It is timeless because it describes the sort of Xmas that is of its time; the 1970s. 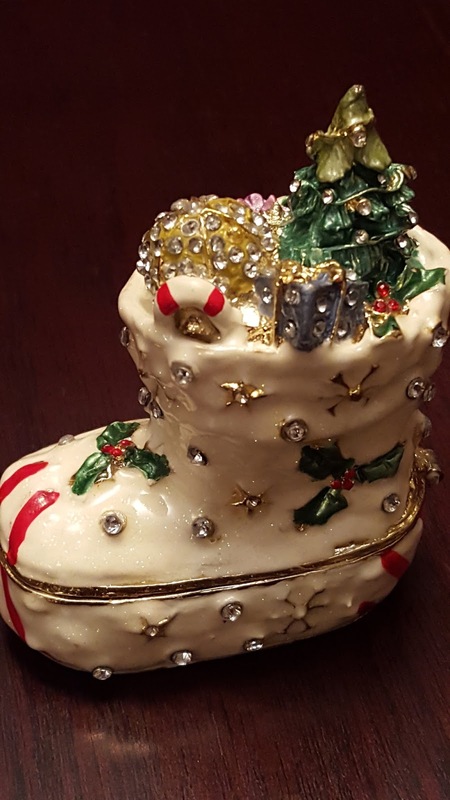 Now more than forty years old it seems as much part of the tradition as mince pies and Xmas lights. The lyric is masterful; conjuring up crowded rooms, homemade decorations, party hats, big dinners and embarrassing relatives and is tied to a bouncy tune that would translate into other genres if someone tried. Imagine a dance version? It’d be fantastic. This is the yardstick against which all post 1973 Xmas songs must be measured and few have matched it. “It’s Christmas! !” yells Nod at the end in case we hadn’t quite got the message. And as soon as you hear this, it is. Some people reckon that the true meaning of Christmas has been lost and that it’s all about commercial things nowadays but that’s an issue that may never be satisfactorily resolved. My less pressing thing today is that one thing which definitely has been lost is a bit of Christmas class. The other day I took a look at the Christmas shop in a well known department store which shares it’s surname with a TV detective, Yes, I was in Taggart’s department store! Seriously though, the latest festive decorations are just too glitzy for words. Covered- no, smothered- in glitter and painted in neon pink some reindeer are the first thing to catch the eye. This seems to set the tone because everything I saw was the sort of thing that is expensive, which people think is classy but is actually not. Sort of like those big golden cherubs you can buy but shouldn’t ever buy. Whatever happened to traditional Victorian style Christmas decorations? Blogmas#2 So, how do reindeer fly then? About three Christamsses ago there were reindeer in the city centre. Not running wild because they were so quiet that would be underwhelming; actually had the fencing around them been taken away they wouldn’t have really run wild they would just have mooched about mildly. Reindeer you see don’t really seem to get excited about anything much. Perhaps they were overwhelmed by the number of people looking and pointing at them saying “ooo, reindeer” as if they didn’t already know that. Perhaps they were biding their time waiting for a slight gap in the fence and they’d spring into life charging at the gawping public nostrils flaring, teeth bared, antlers ready to kill. Or they could just have flown away. Or probably not. Had the barrier somehow become they probably would have meandered down the road gratefully accepting the food people would inevitably offer them. And therefore become very fat and unable to fly. It’s a fairly established fact that reindeer can’t really fly and if you look at them how could they? A brisk flapping of hooves is just not going to provide the necessary momentum to lift them off the ground is it? So where did this idea come from? Santa Claus (as opposed to the very real Father Christmas) is based on two Dutch folklore characters called St Nicholas of Myra and Sinterklass who used to travel about a on a white steed. The first reference to flying came from the author Washington Irving in 1812 who described St Nicholas as riding “over the tops of trees” and this seemed to become an established iconic seasonal image. Nobody has really come up with a suitable explanation for how it could happen but they might be looking at the puzzle the wrong way round. 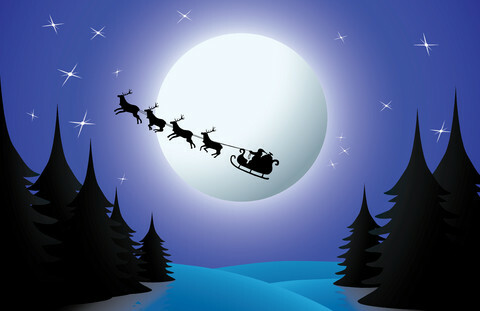 Supposing it is the sleigh that flies not the reindeer? Supposing that the sleigh is powered by a special battery that uses lunar energy which is similar to solar energy but scientists don’t want to tell us about that yet…The power encases the sleigh and the air around it in a protective bubble hence the reindeer are running on the equivalent of a treadmill on the invisible platform. This would also explain how it can speed around the world in one night. In the spirit of Christmas that makes perfect sense. The real star of this tightly produced episode is director Moira Armstrong who uses a range of inventive camera techniques, some ahead of their time, to frame each scene uniquely. Rarely does a tv show of this vintage benefit from such strong direction which has the added advantage of making the plot somewhat more credible in realisation than it would seem on paper. Armstrong makes full use of light and shadow, her fight scenes are the best in the series this far and her use of zooms and close ups keeps matters fluid and interesting. She is also very good at suggesting brutality without showing too much. Apart from the sometimes less than smooth glide of the cameras it could easily have been made much more recently. "Scuse me, is that Instajob? 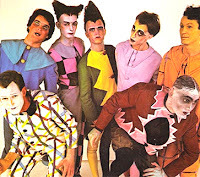 Yes, I'd like to be a pop star this week"
Peter Powell: "Hello! And welcome to another edition of Top of the Pops! You're very welcome as always on a Thursday! Got a great show lined up for you, not only musically but also one or two personalities popping in! But for starters let's just take a look at some of the personalities on the show tonight!" Eddy Grant: Do You Feel My Love? . A repeat from a D*v* L** Tr*v*s presented edition originally shown on 20/11/1980. Eddy Grant spends a lot of time flicking his head from side to side and generally giving the impression of someone who has spent a lot of time in front of a mirror working out how to get the most out of his dreadlocks. Neil Diamond: Love On The Rocks . Bland. A poor choice of camera angle means that Neil Diamond spends a lot of time obscured behind a giant microphone in this promo film. The BBC's powerful new caption generator is put into overdrive and the word Diamond flies onto screen at the end, in a diamond shape. Like the Doctor, Steven Moffat doesn’t like endings. But it’s high time he started doing so. 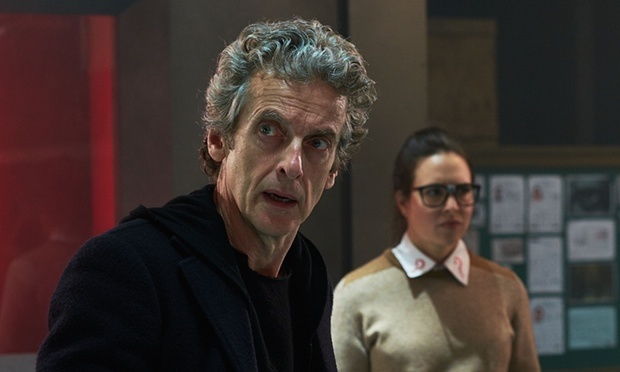 Chalking up his fifth successive series as show-runner/chief writer – now free and clear of his predecessor in the seat, Russell T Davies, not to mention clocking up more time-travel miles than the majority of the original series’ producer tenures – and it’s clear that even he is making exit strategy contingencies. But for a show that pretty much consumes your every waking moment (and when it occasionally doesn’t, then Sherlock fills any remaining gaps) the situation would appear to have arisen that, as of this moment, there is nobody to step into the breach. Moffat’s tie-in interview with Radio Times this week is telling: he claims to be actively involved with helping appoint his successor but at the same time won’t leave the show in the lurch. Or, in 1980s speak, he has been persuaded to stay on. 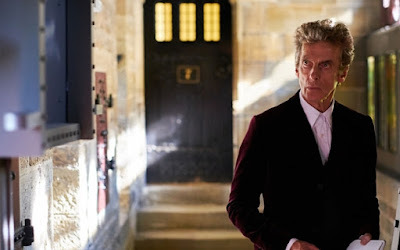 Whether the delay is down to Doctor Who’s previous lustre having been somewhat dimmed this year by a car-crash timeslot and a seemingly disinterested general public finding World Cup rugby or TV karaoke a more tempting prospect, remains tantalisingly unanswered. 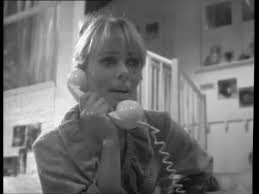 But overnight figures of less than five million and consolidated ones well under seven should be setting off all the bells in anyone’s cloister chambers. And it’s not just those ever so intangible totals that should be of concern, but also the audience share and the fact that even its same channel stable-mates are outperforming it week in, week out. Given that Christmas Day’s annual outing – its eleventh consecutive one since 2005 – has a far more child-friendly, adult-accepting slot of 5.15pm may in part answer that question. Because irrespective of falling figures across the board that even bore witness last Christmas Day, if Doctor Who flops again in less than three weeks you suspect there really will be no hiding place. If you’ve watched any of the BBC this week you can’t have failed to have noticed the advert featuring a sprout. 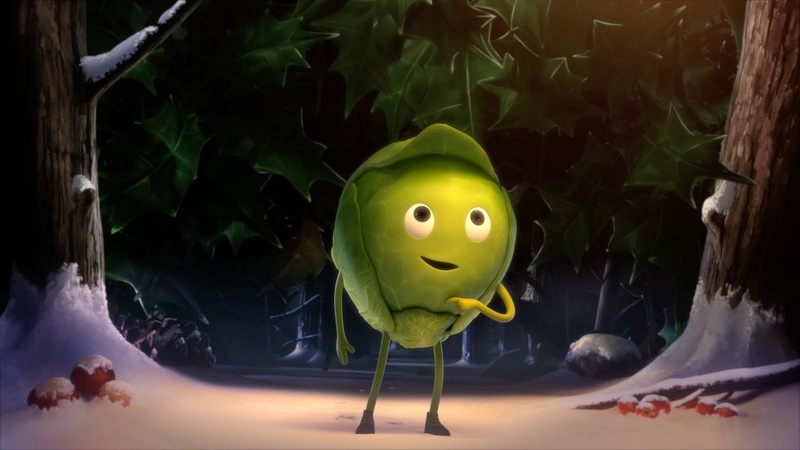 Sprout Boy as he is known is the Corporation’s unusual choice for their festive mascot this year and features in an animated trail for the season. In a Christmassy mess (a Christmess?) our green hero can’t get anyone interested in him until he stumbles upon a house where all the BBC’s stars live together- I always knew this happened- and is accepted and made welcome. He’s happy, we’re all happy. However one word of caution- surely Sprout Boy is destined for the Christmas table along with other veg and potatoes? He may be celebrating prematurely! I bet an hour earlier the BBC house welcomed Sally Stuffing and now she’s warming in the kitchen! Confession, they say, is good for the soul. 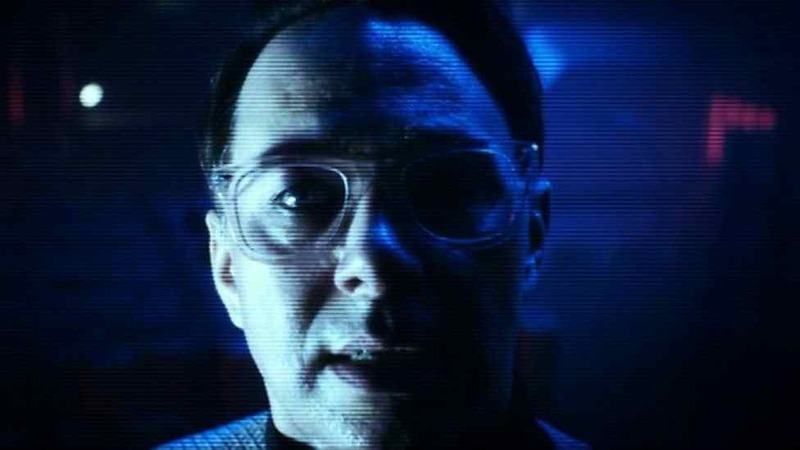 Whether we have now heard the Doctor’s last confession, one thing is certain. I have to confess that I doubted – again - that Steven Moffat had something this good still up his sleeve after five whole series of orchestrating Doctor Who’s post-renaissance renaissance. Maybe I was just too scared to hope. Either way, this is television of the very highest standard. And what a time to choose to pull the metaphorical rabbit out of series nine’s hat, with just one week to go. ‘Heaven Sent’ is so good you don’t really need that coda, as the deserts of Fuerteventura pan upwards to the gleaming city of the Capitol. Gallifrey Falls No More. Simon Bates: "Hello and welcome to Top of the Pops. It's nice of you to join us. We'll be working our way up to the new number one... maybe... just before eight o'clock. But first of all let's take a look at the other goodies, or some of them, you can expect to see on tonight's edition. Starting off with a fantastic lady, and you know what she looks like." Iron Maiden: Women In Uniform . The lead singer's diction is terrible. He has strong opinions about women in uniform but whether he's for or against them is not clear. All I can gather is that sometimes they look cold. Well then surely their uniform should include sensible winter clothing? 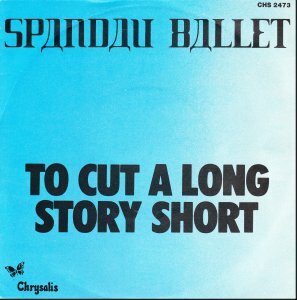 Something which hasn't been discussed yet is the band captions at the end of each performance -a dull subject yes, but still more interesting than this song. They've been gradually getting more sophisticated over the last couple of months. In the olden days it would just be the band's name, but here the words Iron Maiden are repeated down the screen as a list which then shrinks back up to the top of the screen before zipping off to the right. The BBC has obviously invested our licence fee money in a new caption generator. Like London buses, you wait ages for female Doctor Who writers to come along then two come along at once. But unlike Catherine Tregenna, debut scribe Sarah Dollard didn’t cut her teeth on Who stablemate Torchwood, but rather Merlin, Being Human and…Neighbours? But hey, since Doctor Who returned in 2005 it has more or less adopted the soap template of putting character before plot, emotion over drama. And there’s no end of both of those in ‘Face the Raven’. BIG SPOILERS PAST THE BREAK..
Once again David Bowie has proved capable of a musical left turn. We expect it of course but we never know what the direction will be. The surprise of 2013’s `The Next Day` was it’s unexpected appearance; the album itself turned out to be one of the singer’s more conventional (albeit excellent) releases not a million miles from where he’d left off a decade earlier. Last year’s `Sue (or in a season of crime) was actually more of a marker for the future than we imagined though `Blackstar` is an altogether more fascinating composition. 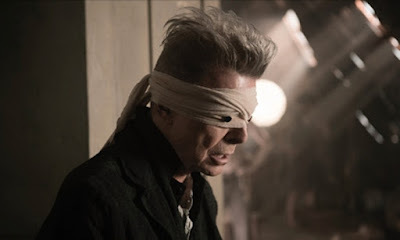 The video – directed by Johan Renck- is packed with imagery which might be symbolic or might be there because it looks great. Neither singer nor director seem willing to explain it’s secrets. Oh and it’s ten minutes long which in these days of short attention spans is the equivalent of releasing a 25 minute piece of music. Adam Adamant’s fencing prowess gets a run out in this Avengersesque confection from the pen of Brian Clemens whose ability for intriguing ideas was let loose across several series during the Sixties and Seventies. On this occasion he conjures up a bunch of villains who offer to help financially strapped businessmen fake their death to avoid incoming tax demands only to deliver a genuine killer blow. Investigating Adamant discovers they all shared the same psychiatrist so he sends himself in under the guise of `Adam Smith`. 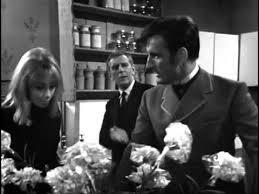 Part of the fun of the episode is his attempts to pass off his detailed knowledge of the turn of the century as some kind of delusion and it helps that John Le Measurer is playing the role of listener with that careworn expression only he can muster. 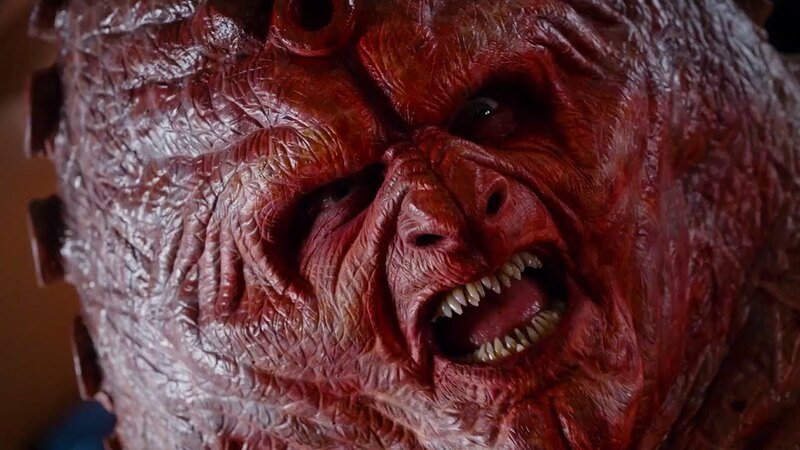 As opening gambits go, being addressed to camera with the words “You must not watch this” is probably not the best piece of self-publicity that Doctor Who could use right at this moment. Four million people – hopefully all awake – tuned into ‘Sleep No More’, which is actually one of the healthier overnight figures series nine has achieved. But when placed into the context of over six million Strictly viewers either switching over or switching off, that figure is a very long way from the heydays of 2005 to 2009, and weak even when placed against the gradual decline post-2010. While insomnia doesn’t seem to be a problem for the Doctor either on or off screen, absentmindedness certainly seems to be. The show that is attributed for resurrecting the communal Saturday audience has itself become left behind in a slot that is neither fish nor fowl, nor use nor ornament. Collateral damage in the on-going fight between interactive talent show contests. [A big wide shot of the Top of the Pops studio filled with a heaving throng waving balloons around and dancing to Ottawan's D.I.S.C.O. No, hang on a minute, the Top of the Pops copy of D.I.S.C.O has been worn flat by constant repetition and instead the crowd are shuffling to the Stephanie Mills song Never Knew Love Like This Before]. Peter Powell: "Hello! Welcome to another edition of Top of the Pops! You're very welcome, as always, and to present the show with me... one Colin Berry! Colin Berry: "Nice to be here Peter." Peter Powell: "And you've been up early in the morning's haven't you?!" Colin Berry: "Yes, I've been sitting in for Terry Wogan all week." Peter Powell: "What else do you do?! Do you go around Europe with a jury?!" Colin Berry: "Yes I do European pop jury once a month." Peter Powell: "But this music in Europe is nothing like the music in Britain! Let's face it!" Colin Berry: "Oh, you're so right." Peter Powell: "Just look at our charts, for instance!" Colin Berry: "Which I'll be doing later on." Peter Powell: "Good! And meanwhile,we'll tell you exactly who's on the show, or just some of the acts you can see on tonight's edition of Top of the Pops!" I only really need to talk about that speech, don’t I…? It’s not often Doctor Who has such a cultural resonance that you just sit there and shut up. And it’s even less often that an actor in the lead role is given the kind of material to work with that he rises to the occasion and hits it so far out of the park that not even that little girl in the John Lewis Christmas ad will be able to pick it up on her telescope. But Doctor Who and Peter Capaldi did that tonight, and then some. BBC One, Saturday 31st October 2015. 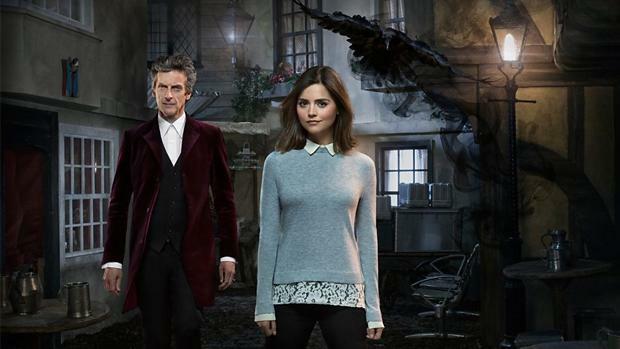 Starring: Peter Capaldi, Jenna Coleman, Ingrid Oliver, Jemma Redgrave, Rebecca Front, Jaye Griffiths. Written by Peter Harness, Directed by Daniel Nettheim. Reviewed by Sean Alexander. Irrespective of whether your politics come with a capitalised P or not, you’re probably a long-term Doctor Who fan because of its subversive nature. If your own political awakening came from the likes of Malcolm Hulke, Robert Holmes or Andrew Cartmel (probably the only man to profess a desire to bring down the British government as a job clincher) it’s safe to say the show that first set out its soapbox stall during the socio-political upheaval of the 1960s has always attracted the more militant minded, and politically aware, sections of the viewing audience. Tommy Vance: "Well let me tell you. Have we got a party or have we got a party? 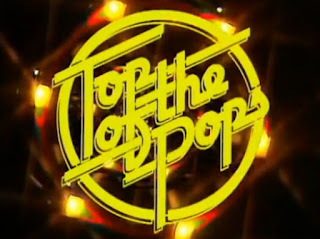 Hi everybody, I'm Tommy Vance and welcome once again to Top of the Pops. Aaaall... whatever is going to break out tonight, starting with this bit of a menu to see what's on the show." 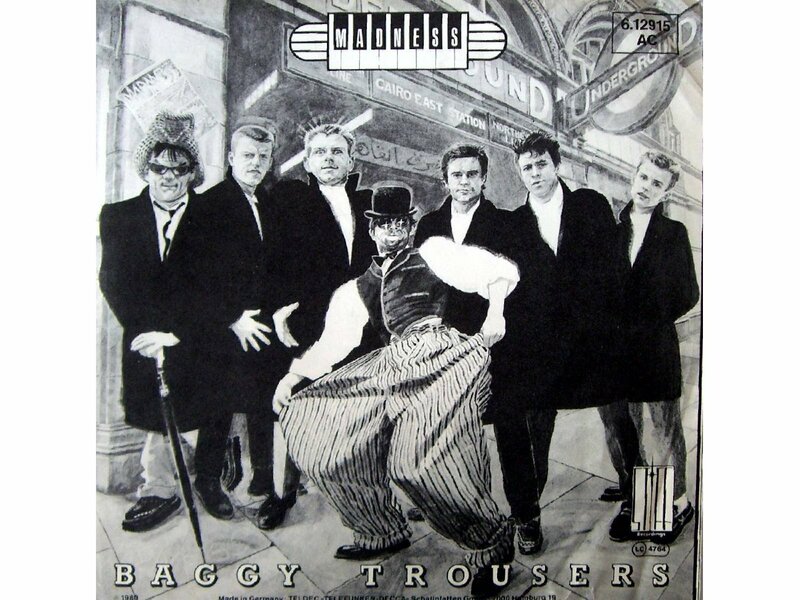 Madness: Baggy Trousers . This song's long slow drag up the charts hasn't been helped by by BBC4's two month break for the 2015 Proms. It first appeared on the 18/09/15 edition which was repeated back in July. Now Baggy Trousers has stalled at number 3, kept from climbing any higher by Ottawan and The Police. It turns out this isn't a live studio appearance, but a repeat from a skipped D*** L** T***** show which went out on 02/10/1980. Distractingly the rows of seating behind the band seem to be filled with the audience's mums. In which those painful moments in our lives just won’t recede however much time passes. It’s not a new observation so you have to give writers Alison Schapker and Grainne Godfree credit for managing to make it seem fresh. Especially pleasing is the way the theme runs easily through both Barry and Caitlin’s stories broadening out the episode. The pace slows a little to let some longer scenes breath and they are tenderly rendered but with just enough wit to stop them becoming too syrupy. Aggressive advertising of a sinister nature alerts Adam Adamant in this crisp instalment penned by Robert Banks Stewart. A new perfume called Cloud Seven becomes an overnight sensation because the giveaway plastic blue carnations contain a highly additive perfume. Only Adamant seems to suspect something is going on, not least when he finds a giggling Simms and Georgina. His means of investigation is the opposite of undercover as he simply walks in to the company’s headquarters to confront its director Benjamin Kinthly. The latter has definite dictatorship traits and an ambition to match which actor Charles Tingwell exploits to the full. Peter Powell: Hello! As you can see we've already started but you're very welcome to tonight's edition of Top of the Pops, and a great show lined up for you needless to say! And here's just a look at one or two of the artists who are going to be on tonight's show!" Status Quo: What You’re Proposing . The crowd are very rowdy. They're still fired up with excitement after being allowed some freestyle dancing to D.I.S.C.O at the top of the programme and now Status Quo is the extra fuel being poured on their dancing fire. The band get into a muddle at the start of the instrumental. Rick Parfitt has drifted to the back of the stage, and when he wanders back there is a log jam as he and Francis Rossi try to change places. Rick Parfitt shuffles backwards while Francis Rossi has to take a couple of giant steps to avoid the edge of a rostrum. Still it all gets sorted out in time for the guitar break. There’s been a trend for darker, moodier heroes on TV in recent years perhaps as a reaction to the snappy likes of Buffy and company so it’s refreshing when a show comes along that takes a different path. While it would be inaccurate to describe The Flash as a laugh a minute- and it does have darker moments- the general tone of this pilot is lighter than almost all recent new series. Appropriately enough the pace is also considerably faster with a narrative that is equivalent to developments that in other series would take several episodes. It does a splendid job of setting out the basic parameters of the show as well as providing a few pointers to the future. 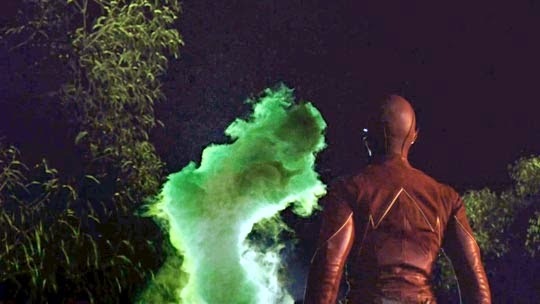 It’s particularly impressive when you consider that while being able to run super fast is a very, very cool power (as X Files- Days of Future Past proved) beyond clever showboating effects sequences there needs to be some ballast to carry a series for 24 episodes a year. Pleasingly there is plenty of that squeezed into this supersonic 42 minutes. Oh yes, there you are online doing things leaping from one place to another when all of a sudden your screen fades to a grey pallor and everything stops. The Internet stops! Well not the actual Internet I suppose. 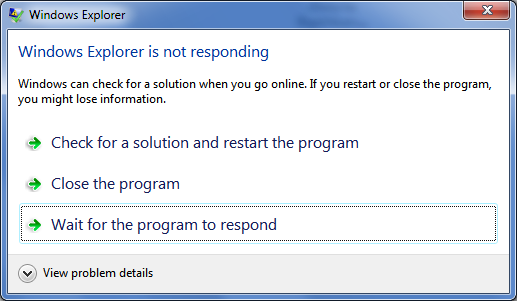 Anyhow there then appears a little message to say (not responding). Yep, that’s the sum of the information you’re getting. Of course you know full well that your device is not responding because – big clue- it is not responding!! So why tell us? Surely a more helpful message would be to tell us why it’s not responding; wouldn’t that be a tad more informative? The final insult in this message is that it is in brackets- as if it doesn’t matter. Imagine if we did this in our jobs every so often. Just stopped working and held up a cardboard sign saying Not Responding. In brackets of course. The unkindest cut of all. An abrupt edit means Top of the Pops begins in media res with Mike Read already describing the delights on offer in tonight's programme. Whatever did he say that was too hot for BBC4 to handle? We will never know. That moment is lost to us like a tear in the rain. Black Slate: Amigo . A very laid back opening to the programme. The song is nice enough but it can't compete with the lead singer's giant sombrero. Split Enz: I Got You . Leo Sayers pops up in a burst of pre-recorded applause to co-host the show. 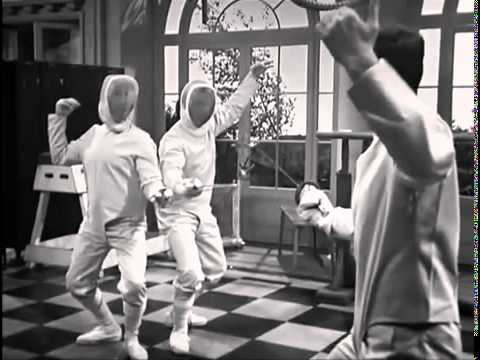 An explanation of how he and Cliff Richard swapped songs (Leo Sayer wrote Dreamin') allows Mike Read to do his hilarious Cliff Richard impersonation which always goes down a storm when Mike is playing tennis with Cliff and Sue Barker. I Got You should not be confused with the Sony and Cher song. Proving it is possible to combine any unlikely circumstances in one script, this lively windswept second has Adam Adamant on the trial of a circuit diagram found in a stick of rock for which a man has been killed at a party Georgia happens to be at. It’s Blackpool rock and with the Victorian panache only he knows, Adamant is soon strutting along the Golden Mile with a stripy clothed Georgia in tow buying sticks of the stuff. It’s all so bizarre that it kind of works. 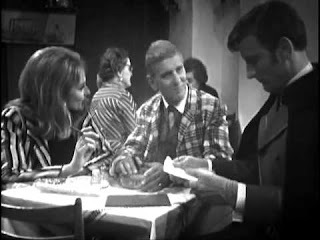 Second episodes are tricky to pull off and this Tony Williamson penned example manages to contain a scenario you wouldn’t expect in particular taking the characters out of London before they’ve established themselves in it. Still it’s funny to see Adamant with cloak and cane taking the pavements of the seaside town as if he owned them.